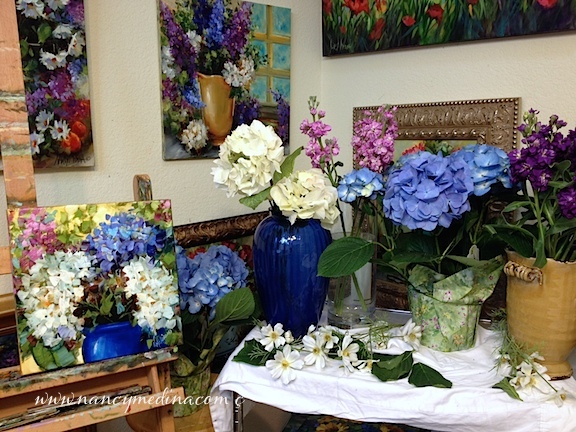 Midnight Garden Hydrangeas was completed around...midnight yesterday in the studio, a small study to warm up my brushes for a new three foot container garden of hydrangeas in progress. I'm preparing a new series of large gallery wrap container gardens in preparation for my one and only annual outdoor show at Dallas Arboretum. Artscape will be held April 26-27, with a member preview the evening of April 25. 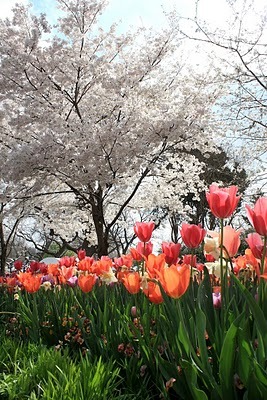 You are invited to join me and almost 75 other artists under the cherry blossom trees. 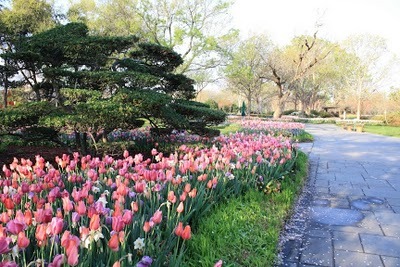 This will be a fun show in the most beautiful gardens in North Texas staged at a time when the azaleas, tulips, daffodils, and every flower you can imagine will be blooming simultaneously. The sculptor from the West Coast who makes the giant moving metal zoo animals painted in bright colors will also be there, with a crane and 18 wheeler to unload each of his newest creations. 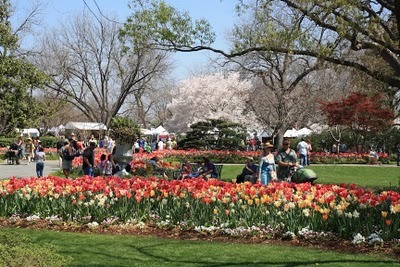 There are so many amazing things to see, you won't want to miss this! 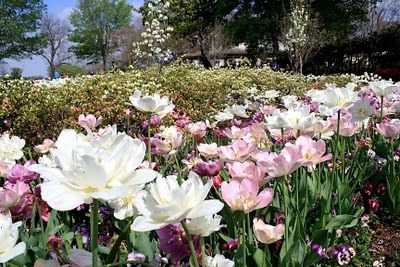 Last spring seeing the gardens in April was a bit like walking into Oz. 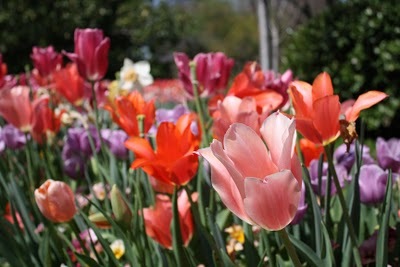 Here are some photos of the gardens, below, this should help tickle your fancy and get you in the flower mood. Bring your camera and your comfy shoes and arrive early for the show! Okay, enough business! Let's go look at the bloms! These gorgeous flowers were just up the path from our tents during the last Artscape. I wish you could smell the perfume, it was nature's own signature scent. Of all the photos I took, a few turned out accidentally good. This one I am most proud of, it has an artsy feel to it. 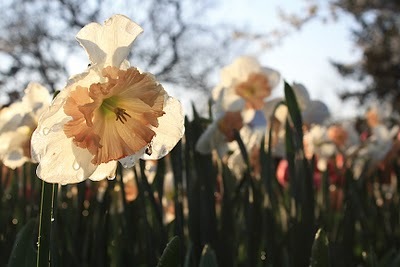 The daffodils were just waking up when I took this photo, and were covered in morning dew. See our tents in the background? 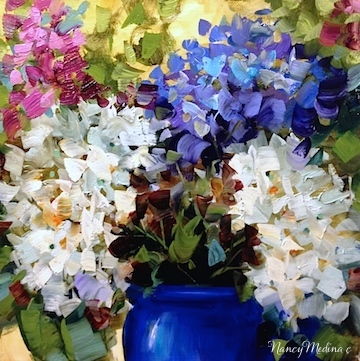 Imagine having an art show in a setting with pansies, tulips, and dozens of other flowers in bloom. It was heaven on earth all weekend! of my jeans all stained from wet grass. It was worth it! I love the blue shadows, can you see the cherry blossoms on the walkway? out of my paperwork and frames when I got back to my studio. 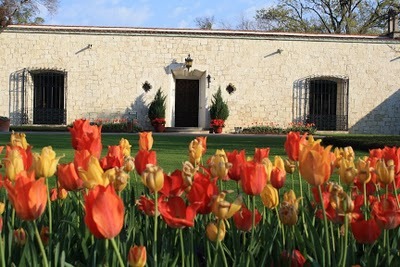 The historic DeGolyer House mansion. The residence was owned by Dr. and Mrs. DeGolyer, and I was honored to have my art hunt in the DeGolyer house during the Garden Gallery juried show. Yes I do love orange! And pink, and especially purple. And did I say how much I love pink? One of the moments during the last Artscape show I will always remember was when a father pushed his daughter up to my tent in a wheelchair. She had spotted a sunflower painting in a pink pot. He said her bedroom was in those colors and she loved them. I asked her if pink was her favorite color and she nodded shyly. As he paid for the painting, I sensed that her Father would do anything in the world for her.